Epic flying awaits you at Soboba! Come fly with us and experience for yourself the “magic air” that makes Soboba a World Class destination paragliding site. A 2200′ south facing mountain located in sunny Southern California assures 320+ flyable days per year. Soaring flights of many hours are the norm, even for beginner pilots. 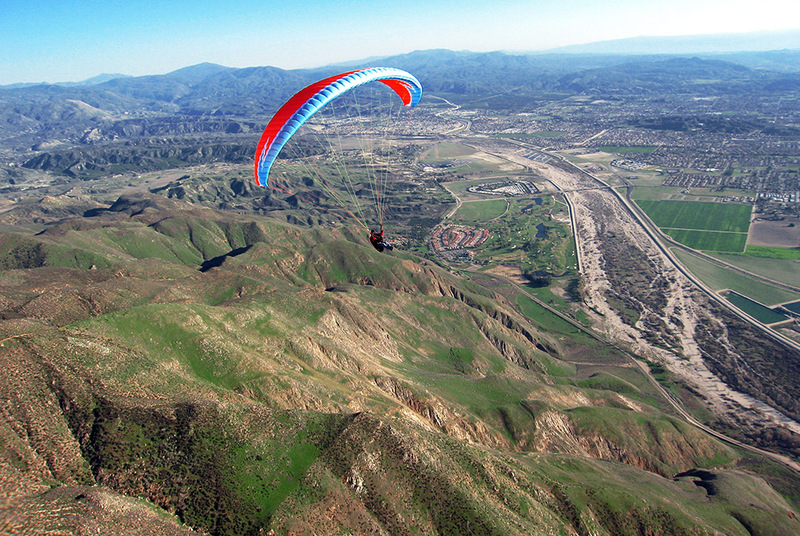 If you are looking to learn paragliding, Soboba will accommodate all of your aspirations. You can show up with zero experience, set up a tent (if camping is your thing), and focus solely on becoming a skilled pilot. Learn how our mountain training site offers a unique learning experience that accelerates skill progression. Take a detailed look at what to expect in the training program from the moment you arrive. 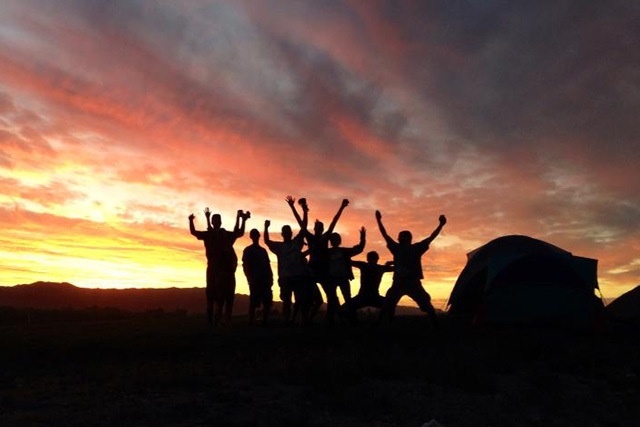 Find out more about our mountain, facilities and people that has given Soboba such a great reputation in the paragliding community. The sport of paragliding has evolved in great magnitudes over the last decade, and with this evolution there has been a tremendous increase in safety. Wings have become more efficient, less collapse prone, and easier to handle. Like any other flying or adventure sport, there will always be risks, which can be managed and minimized with the right training and attitude. A pilot with modern gear and good judgement can fly injury-free well into old age. Of course, you can also take the opposite approach, continually scaring yourself, and perhaps get lucky enough to escape injury. We obviously don’t condone this behavior, and steer well clear of those who do. You will fly solo on your very first day of training, and it takes 7-10 days to master the required skills to earn your P2 rating. Believe it or not, the flying is easy. What takes a good portion of time to learn is “kiting”, which is controlling the wing overhead while standing on the ground. Not only does this make you a better pilot, but it is fun! Also, you can go out and practice your kiting just about anywhere. So if you take your wing home with you and do your kiting homework, you can get through the P2 course in minimal time. Does Soboba Paragliding really provide any unique advantages over other schools? Yes, we absolutely do! More than anything it is because of Soboba’s unique combination of a mountain site with a quickly accessible launch. For new pilots, this means the difference of many days (or even weeks) training time. We don’t need wind to fly! When setting out to earn your P2 paragliding rating, there are two primary goals you will be looking to achieve: minimum number of flights for the P2 rating, and the necessary high flight (over 500′) skill sets. Soboba offers the perfect combination of a mountain site with a fast turnaround time of less than 5 minutes from the landing area to the high launch. This way a student can get multiple flights per day (as many as 10! ), from an altitude where they can start learning to soar from their very first flight. Students can start getting their laps in early in the morning, since Soboba isn’t dependent on having wind to fly. Also, there is no requirement to do a tandem flight as part of our curriculum, since we have multiple “step-up” launches for safe solo progression. Training through the P2 license is $1875 with gear purchase (most students choose this option). We also offer a 1-day introductory lesson for $375, which counts toward your total P2 training tuition. All training days are full 8-10 hour days and very often private lessons. A complete paragliding system, which includes the wing, harness and reserve parachute, will range between $4,500 and $5,500. When properly taken care of, this gear will last you hundreds, and maybe even thousands, of flights. More info on the breakdown of training costs is here. What kind of flying can I do with a paraglider? There are many different types of flying you can do: “Sledders”, ridge soaring, thermal flying, cross country, acro, paramotoring and speed flying. The Sledder is simply flying from the top to the bottom of a hill, and you will do many of these in your training. The next goal is to master soaring techniques, with ridge soaring being the first since it is generally the easiest and safest to do. This type of soaring occurs at a hill, mountain, ridge or cliff, where the winds are coming straight in and strong enough to sustain flight by being deflected upward. Thermal flying involves riding “heat bubbles” high into the atmosphere, and very large climb rates and altitudes are possible with this type of flying. Cross country flying is achieved by connecting the thermal dots in the sky to fly large distances, sometimes hundreds of miles. Acro, short for acrobatic, is radical maneuvering of the wing such as spinning and looping. It would not be incorrect to call this a risky activity. Paramotoring is simply adding a motor on your back, allowing you to takeoff from just about any large open area, and fly for as long as your fuel lasts. Finally, speed flying is the newest discipline, and involves using a much smaller wing for higher speeds and more maneuverability. We teach all of these! Do you have answers to other Frequently Asked Questions? Yes, we have a comprehensive FAQ page here.